Well, we've come to the end of the month! I'm incredibly proud to say that I've completed my Squaduary pledge of five Skitarii Vanguard. 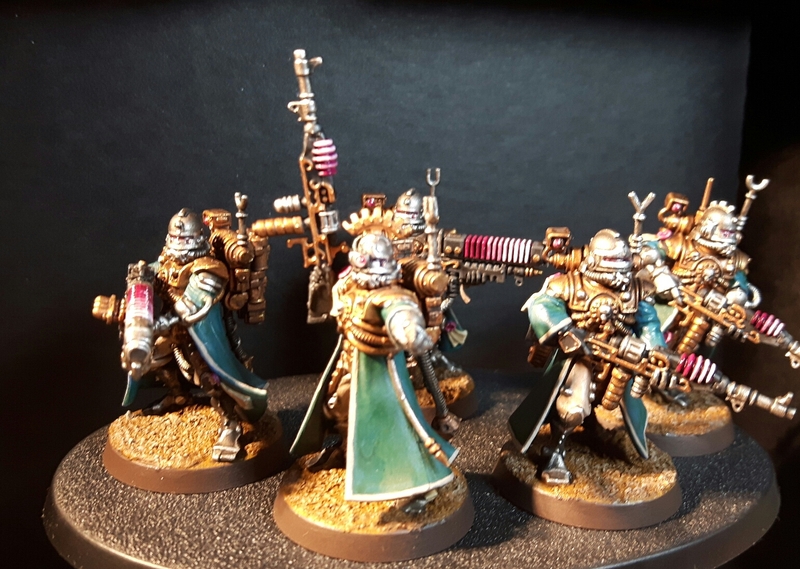 I would have liked to have painted more of the squad but that was always going to be an ambitious target and between playing a few games of 40k and painting other projects it slipped through the cracks. The finished squad in all their finery. 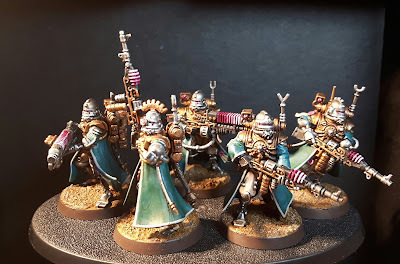 Painting these guys has been a thoroughly enjoyable experience, the models are great and I'm pleased with the overall finish. Hopefully this will spur me on to painting more of my Adeptus Mechanicus minis. Speaking of being spurred on, Swordmaster over at Path of an Outcast is running an event called Monster March. You guessed it, the idea is to paint a monster in March! The event is really aimed at fantasy creatures but Swordmaster has been incredibly generous and allowed me to pledge my Kastelan robot maniple (they are monstrous creatures after all). So expect further updates here as I attempt to paint both of the robots along with their attendant Cybernetica Datasmith. Will I fall at the first hurdle or will it be another resounding success? Only time, and my battered paintbrush, will tell! To round off Squaduary, I'd like to say a huge thank you to Rory over at Stepping Between Games, for running and organising the event. I must say that seeing the photos of everybody else's work was enormously motivating and really pushed me to finish the entire squad. If you've missed out and want to read the rest of the Squaduary journey you can do so here, here and here. Very nice work, and congrats on completing Squaduary! 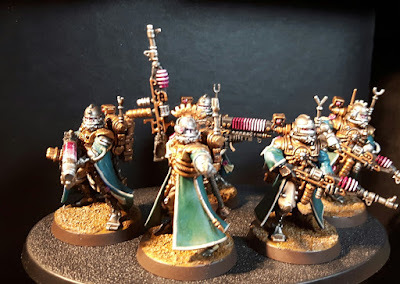 Thanks Michael, congratulations to you as well, the Deathwatch are looking excellent! Will you be participating in Monster March? Yep, already signed up. Got a Terrorgheist that has been waiting on paint for 2 years now! Great job on the squad Ed! Well done for completing everything, they look really well. Thanks Rory, and thanks for running the event. I for one had a blast!